This truck would have to be a capable wheeler compromised with street ability. My kids want something akin to the old rig - a YJ on 35's with a V8. They liked how high it was, the fact that it was orange and it rumbled. I wanted something a little more capable with tires in the 38" range and dual cases. I also wanted to be able to run it down the road, full of kids and be able to tackle any trail. This rig will be built simply with proven Pirate4x4 technology and parts found on the Pirate Board. I originally looked around on Craig's List in my area where I found and bought a basket case 1990 Jeep Wrangler (YJ). I picked a Jeep because I know Jeeps pretty well (I've had 14 to date). I picked the YJ because it's very easy to swap full sized axles under them (they share a similar frame width) and because they are very common. Did I mention this one was very, very cheap? Someone had already swapped in full size Chevy axles, but really didn't do a very good job. The frame also needed repair, which I didn't notice when I bought it. It came with a Dana 300 transfer case and SM465 transmission. Overall I have no regrets about the purchase, but I can't justify spending the little time I have repairing this frame and tub when there are better deals out there. I decided to post an ad on the Pirate Board wanted section (http://www.pirate4x4.com/forum/showthread.php?t=491639 ) that I was looking for a frame and possibly a tub. I got several responses but one really intrigued me. Davey Lesick responded that he has a New Old Stock (N.O.S.) YJ frame that's never been used and I could buy it for a reasonable sum. I felt that his frame would be great, but something used would probably be more suitable. I had plans to swap in a Big Block Chevy which would require cutting off the existing engine mounts, install full size and relocated axles, thus cutting off the spring mounts. I think you get the point. He then mentioned that he runs a Jeep recycling yard. He took pictures of several YJ's that he thought would suit my needs. Since I hadn't been on a road trip in quite some time, off I went to Salem, Ohio with my trailer in tow. The road trip itself was uneventful, but other than the traffic on I-80 across the great state of Pennsylvania. Everyone should sit next to a dead Possum in the middle of a 95 degree summer! I had my dog with me who was giving me accusing looksÉ At first, I thought it was him! Then I figured out a little dog couldnÕt stink that bad for more than an hour. That would be hundreds, and I do mean hundreds of Jeeps in all conditions. I thought to myself, I could build 50 rigs out here. Apparently Davey feels the same way. He's currently building a trail LJ for himself with a few surprises. Davey loaded my trailer with his forklift, added an NP231 for my doubler set up to the mix and sent me on my way. Overall, I'd say he's an excellent business man and has one hell of a Jeep Yard. I think it's safe to say if there is a part you need that Jeep made, Davey has it. I asked Davey to write a bit about himself, so you all could get to know the type of guy he is. He really didn't want to do it, but I think his wife (Beth) sweet talked him into it. "HI, MY NAME IS DAVEY LESICK. I GREW UP IN AND AROUND THE SALVAGE BUSINESS. MY DAD AND GRANDPA HAD BEEN IN THE SALVAGE AND DEMOLITION BUSINESS ALL OF THEIR LIVES. MY DAD'S BUSINESS IS CALLED LESICK SALVAGE. HE HAS BEEN SELLING WRECKED CARS AND TRUCKS FOR ALL OF HIS LIFE. I BRANCHED OFF OF HIS BUSINESS AND MY WIFE AND I STARTED DAVEY'S JEEPS. 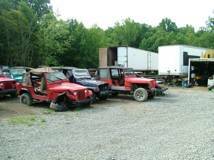 WE SELL WRECKED REBUILDABLE JEEPS, ALL MODELS, ALL YEARS. YOU NEVER KNOW WHAT WE MAY GET IN. BUYING A WRECKED JEEP IS A REALLY GOOD WAY TO START A WHEELING RIG, OR DAILY DRIVER. YOU CAN SAVE A TON OF MONEY AND AS LONG AS IT IS REPAIRED CORRECTLY THERE IS NOTHING WRONG WITH ONE. WE ALSO SELL USED JEEP PARTS. WE SHIP UPS DAILY FROM OUR SHOP. WE ALSO SHIP WORLDWIDE. WE ARE PARTING MANY JEEPS (APPROX 400) FROM 1943-PRESENT. WE ARE ALSO FELLOW JEEPERS. WE LOVE TO GO WHEELING WHEN TIME PERMITS. AT THE PRESENT TIME WE ARE WHEELING A 2004 WILLYS EDITION WRANGLER. IT WAS A SMASHED ONE THAT NO ONE WOULD EVER DREAM OF BUYING. WE SWAPPED IN A STRAIGHT FRAME, REPAIRED BROKEN ENGINE MOUNTS ON THE BLOCK, INSTALLED A WRECKED SET OF RUBICON DANA 44'S, A 241 FROM A RUBICON, PUT A 4" TERAFLEX LIFT ( WHICH I GOT FROM [email protected] ) HE IS A GREAT GUY TO GET CUSTOM AXLES AND SOME NEW PARTS SUCH AS LOCKERS, GEARS, LIFTS. I AM CURRENTLY BUILDING A WRECKED 2005 UNLIMITED. WE PUT A 2005 GTO LS2 ENGINE WITH 4L60E TRANSMISSION FROM A WRECKED GTO WITH 796 MILES, RUBICON 241 T-CASE,2001 FORD E-350 DANA 60 REAR, 78 F-250 DANA 60 KING PIN FRONT. IT HAS 4.88 RATIO WITH ARB'S FRONT AND REAR. I BUILT MY OWN HIGH STEER ARMS AND 1.5" STEERING TIE RODS. WE ARE HOPING TO HAVE IT OUT I THE NEXT MONTH OR TWO. WELL... TO SUM IT ALL UP, I AM A FELLOW JEEPER THAT HAS TONS OF PARTS THAT WE CAN SHIP ANYWHERE. WE OFFER GREAT FAST SERVICE AND QUALITY USED PARTS. WE SHIP EVERYDAY. GIVE US A TRY FOR YOUR NEXT PART. FOR THE NEXT 30 DAYS IF YOU MENTION THAT YOU FOUND US ON WWW.PIRATE4X4.COM WE WILL GIVE YOU A 20% DISCOUNT ON PARTS ( NOT FULL VEHICLES). MAYBE WE WILL SEE YOU ON THE TRAIL. DAVEY AND BETH"
I hope this gave you an idea of what to expect at Davey's Jeeps. I certainly enjoyed my trip out there. I got a great deal for an awesome builder's platform. I'll also be going back at some point for a "repairable" Rubicon Unlimited.